Brother Jesse Blog: Has Islam Influenced Hip-Hop? What Do You Think? Has Islam Influenced Hip-Hop? What Do You Think? 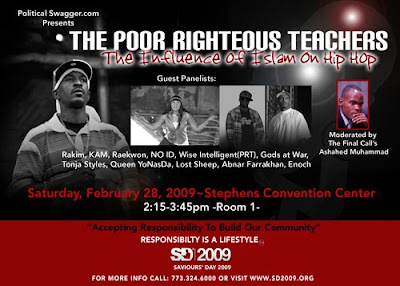 Hip Hop legend Rakim, Wise Intelligent of Poor Righteous Teachers, Raekwon, Kam, NO ID, Queen YoNasDa, Tonja Styles, Lost Sheep, and many more are preparing to have a serious dialogue on Saturday, February 28 here in Chicago during the Nation of Islam's Annual Saviours' Day Convention. Final Call Assistant Editor Ashahed Muhammad will be the moderator. The topic of this workshop will be THE INFLUENCE OF ISLAM ON HIP HOP. DO YOU THINK ISLAM HAS INFLUENCED HIP HOP IN ANY WAY? I look forward to hearing your opinions on this subject and I will pass them on to the moderator! Islam, in particularly the Nation of Islam has had a big impact on hip hop. No doubt! Just look at how many artists have accepted the religion and put it into their lyrics. Islam has produced the consciousness in the music of many artists...even if they don't admit it. Min. Farrakhan has especially influenced hip hop. it has had a major influence on hip hop. Heck even on me and I am not a muslim. But the consciousness in the message motivates me.